Dorothy Carol (Williams) Estes, 76, of Eubank, Kentucky, passed away at home on October 11th, 2018, surrounded by her loved ones. She will be remembered for her beautiful smile and kind heart. Dorothy Carol is survived by her husband of 60 years, Lloyd, and their three children, Ricky (Debbie) Estes of Science Hill, Ronnie Estes of Danville, and Sharon (Steve) Cummins of Crab Orchard, along with six grandchildren, Jill (T.J.) Barnett of Lexington & Jake (Samantha) Cummins of Huntington, W.V. ; Joshua Estes & Joseph (Whitney) Estes of Somerset; Bradley & Brian Estes of Science Hill. She is also survived by 4 great-grandchildren, Aurielle, Andrew, Luke & Landon. She leaves behind a host of special nieces, nephews, and cousins, and her dog, Buffy. She is preceded in death by her parents, Vernice M. and Mary Lettie (Turner) Williams, brother Denton Williams, and sister Evelene Hayes. Born in Lincoln County on December 30, 1941, she was the daughter of Vernice M. and Mary Lettie (Turner) Williams. She was a lifelong member of Pilot Baptist Church where she was the church pianist since her childhood. She also served the Church as Treasurer for many years. Dorothy Carol is well remembered for her service to the Eubank community through her 28 years of work in the office of Dr. G.B. “Doc” Williams. She also spent many years in the offices of Monroe Pallet and Buis Appliance. 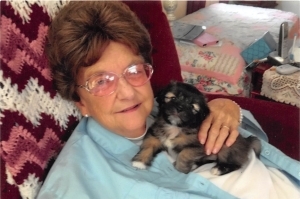 Dorothy Carol loved her family and enjoyed cooking, collecting porcelain dolls and jewelry, planting and tending to her flowers, playing gospel music on the piano and organ, working puzzle books, and her dog Buffy. Visitation will be held Sunday October 14th, from 5 p.m. to 8 p.m., at Barnett, Demrow, & Friend in Waynesburg. Funeral services will be held Monday October 15th at Pilot Baptist Church at 1 p.m., with a second visitation starting at 11 a.m. at the church. Pallbearers will be Doug Baugh, Gary Baugh, Kevin Stephens, Alan Williams, Rodney Miracle, and Johnny Cress. Her grandchildren and great-grandchildren will serve as honorary pallbearers. Barnett, Demrow & Friend Funeral Home is entrusted with Dorothy Carol’s arrangements. Guest Book available at www.friendfuneralhomes.com.